Tramp is the next stage in the continued ascent of the career of Sharon Van Etten. If 2010’s Epic was the introduction of this immensely talented artist to a wide audience, her new release and first for Jagjaguwar Records is the here-to-stay moment. The album is a mix her strengths — intelligent and heartfelt lyrics and a wide range of vocal approaches. There is a nod to her solo folk past (“Joke or a Lie”), and some straight forward indie-pop (“Serpents”), but the vast majority of the record are superb songs mixed to perfection. The presence of producer Aaron Dessner (from The National) compliments and draws out Sharon’s strengths while enriching the melodies. In particular, “Give Out” (streaming below), which debuted live as a solo acoustic number several years ago, is now a fully formed song with layered vocals and a sparse but effective instrumental accompaniment. 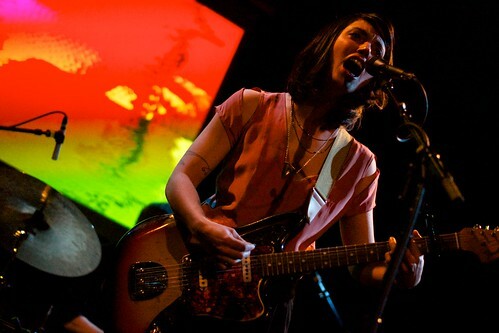 At Bowery Ballroom on Sunday, Sharon Van Etten played the final show of three consecutive sold out shows. Her triumphant return to NYC after an extensive tour was met with crowds filled with family and friends, and gave the locals a chance to see the Tramp live band operating on all cylinders. The work of multi-instrumentalists Heather Woods Broderick and Doug Keith is supplemented by the tasteful percussion of Zeke Hutchins, and on this night Aaron Dessner joined for half the set on guitar. The band breathes life into the songs while staying faithful to the recorded versions. The camaraderie among the players was also obvious on this night, as the banter was often hilarious. Sharon worked through a set heavy on Tramp material (10 of the 12 songs), but which also contained much of Epic and one neat cover (streaming below). Sharon Van Etten continues on tour, with a week in Europe followed by a West coast swing, and a trip through the South. I recorded this set with a new set of Sennheiser microphones supplemented with a soundboard feed. The Sennheiser MKH-8040 is a sleek new cardioid microphones with clarity, warmth and a crisp bottom end that I had not previously experienced prior to this night. At the best sounding room in town, these microphones absolutely shined, and as a result the mix is about 75% room and 25% board, in order to maximize the beauty of the live sound. This is one of the best recordings we’ve ever featured on this site. Enjoy! This recording is now available for download in FLAC or MP3 from Archive.org [HERE]. sounds great, thanks for taping! Awesome sound – thank you. Saw her in Williamsburg – great show. I’ll be seeing her for the second time this weekend in Amsterdam. I’m looking forward to it very much. Awesome job as usual capturing this show. The fidelity and separation is incredible, very powerful recording! Thank you very, very much. i have to say, having seen sharon just a few days prior, it was one of the few shows that wasn’t just great, but actually exceeded my expectations. perhaps i wasn’t entirely sure what those expectations were, until they were surpassed. i knew i was experiencing The Real Deal, so to speak. it was really nice to hear “in line” here. you can tell they were just starting to play it live. this was one of my mental requests, my secondary one… the song i wanted to hear most was “ask.” of course, she played neither… and it didn’t matter. Delighted to get this. Thanks for all the work done to get this out.